Last Sunday, I came back from a visit to the Bullocks' Homestead on Orcas Island in the afternoon, tired, dirty, ridiculously happy, and ready to collapse in a heap on my little blue sofa with some iced tea and The Taste of Place, which I had started on the ferry. But then Lucy came and roused me and told me she had been invited over to Rob's to pick figs. Rob is a fellow farmer, known for his pasture-raised meats which he sells at the farmer's market along with his buddy Guard Sundstrom. 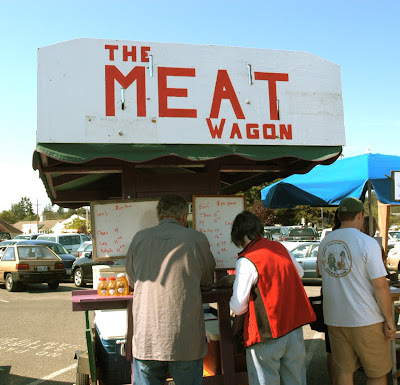 Their Meat Wagon is always busy with folks looking for fresh, local, humanely-raised ridiculously tasty meat. Both Rob and Guard are members of the Island Grown Farmer's Cooperative which is a group of farmers who banded together to design and launch a mobile slaughtering unit that allows for local processing of beef, lambs, and pigs. This unit was the first of its kind in the US and since then groups of farmers' around the country have come to these folks for help replicating the model in their own communities. But Rob isn't just a lamb man, he's a true farmer and, dare-I-say, homesteader. In addition to his animals, Rob takes care of a lovely orchard, and a garden on an adjacent property. He started out 30 years ago in a little trailer; he built a lovely yurt, then a beautiful home where his older son now lives with his wife and children. When Lucy and I arrived at Rob's place, the two big dogs ran out to greet us, barking madly. No one was home so we poked about behind the house, amidst the chickens and the trees, looking for the fig tree. Being city-folk we weren't exactly sure what a fig tree looked like, so we stopped off at the walnuts and the pears and the apples before finally we sighted the little bush close by one of the mobile chicken coops. Right as we started picking, Rob arrived, clean and spiffy from his granddaughter's birthday party. We picked a basketful of ripe figs, then Rob offered us cling peaches from his trees. We walked through the orchard, asking about the different pears and plums and apples -- Asian pears, Bosc, Red Anjou, Santa Rosa plums and about the history of the place. Rob told us of wheeling his pregnant wife to the car in a wheelbarrow back in the days before there was a proper driveway to the house. She vowed not to come back until he built a proper house. He built the yurt where he still lives today. Then he showed us the house that he built back in the early 90s with help from his brothers, one an architect, the other a woodworker. It was a well-conceived house, and very beautiful; white adobe-style walls and huge windows facing out on the orchard and the pond. Inside, the exposed wood beams and gorgeous live-edge counter gave the house a cozy woodsy smell and a warm, friendly feeling. The wood came from trees felled and milled on the property and Rob described the process of forestry management -- taking skinny, distressed trees from beside the thicker looking counterparts because their skinniness was indication of slow, dense growth. 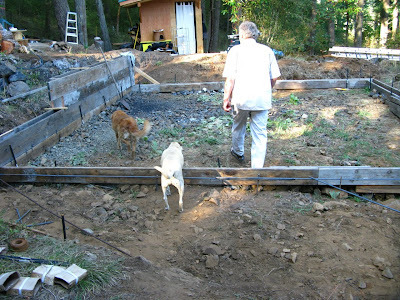 Then we went up to the area where his younger son was just laying the foundation for his own home. We toured the sweet outdoor kitchen, composting toilet, and the wooden frame ready and waiting for the concrete truck which would arrive the next morning. I was inspired, to say the least. My own dad and I have been talking about building a home together. I can't think of very many things that would be more satisfying. 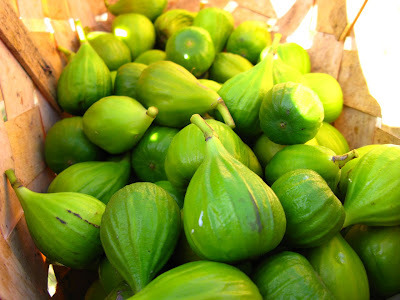 I ate most of my share of the figs fresh within a day or two -- subtle, sweet soft flesh popped into my mouth whole. All that remained was a little pile of stems in the compost bucket below the sink. But then, the remaining fruits started to get a little soft. I didn't want to eat them all at once, so I looked for a way to turn them into something else to savor. I wanted to pair the figs with anise -- one of our local bakeries makes an amazing yeasted Fig Anise Bread and I'm obsessed with the combination. It's warm and crunchy and slightly spicy. But I wanted to make a breakfast bread, so I looked around for recipes with fresh figs and fell upon instruction for a Fig Tea Bread by Jenny Colvin of Jenny Bakes. 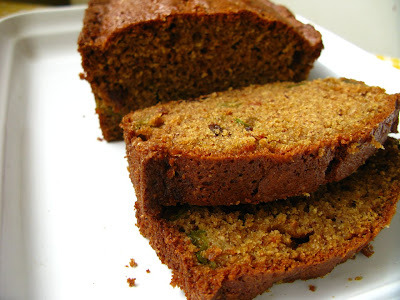 It turned out that the tea in the recipe gave the bread a deep, smoky richness and lovely color and the seeds from the figs distributed through the bread gave a lovely crunch -- something like poppy seeds in other breakfast breads. 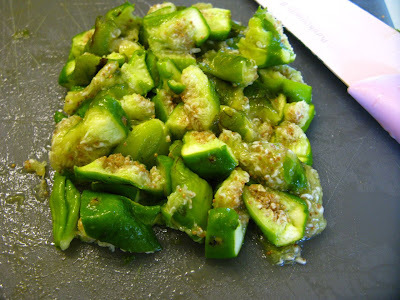 I reduced the other spices and the sugar, so the star anise flavor came to the fore, perfectly complimenting the soft sweetness of the figs. 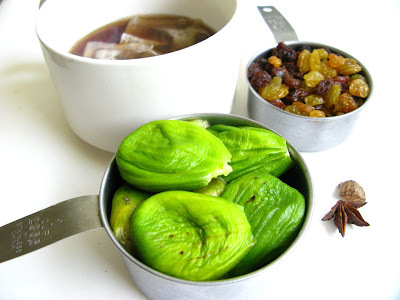 Gently combine figs and tea; let stand 10 min. 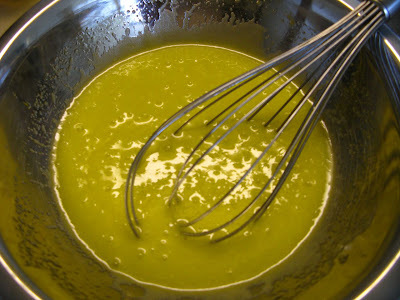 In a medium sized bowl, beat sugar, oil and eggs to mix. Sprinkle flour, spices, baking soda and salt on top and mix until just combined. 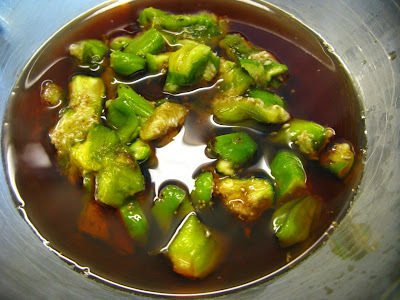 Drain tea from figs, reserving 1/4 cup of liquid. 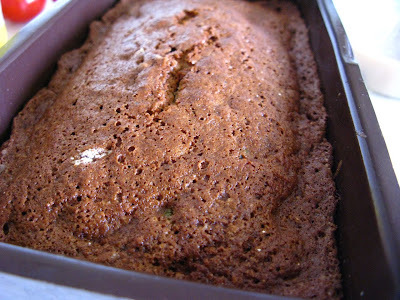 Gently stir in figs and ¼ cup tea; pour batter into well-greased loaf pan; bake at 350º F for 1 hour, or until toothpick comes out clean. Cool in pan 10 min., then invert onto a rack. Keeps on the counter in plastic wrap for up to 1 week, or freeze slices in plastic baggies and thaw in the toaster or microwave. 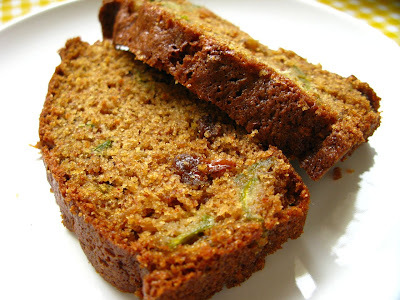 Fruit breads are lovely...Banana bread is my recent favourite. Would love to make this with some Lightly spiced Chai tea syrup with extra ginger! Yum, served with Creme Fraiche. @ Ozoz: Yum Chai tea syrup sounds awesome. Love the creativity. Just make sure if it's sweetened that you reduce the sugar in the recipe. Hey Jess, I saw this recipe and just had to give it a whirl. 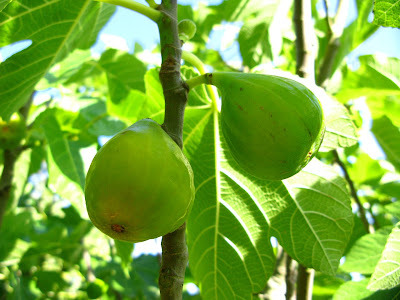 How could I not with a tree full of figs in my very own yard? It came out so good!! Unfortunately my roommate turned the oven up to 400 degrees to cook some yams while I was prepping the bread and I didn't notice. 45 minutes into the bread baking I'm wondering why the outside is getting so dark while the inside isn't done yet. The joys of having roommates! It was good nevertheless. Things I would try for next time: Also soaking the raisins in the tea, perhaps using a natural black chai tea, or adding cloves, ginger or allspice. yum. would definitely make it again. Thanks for sharing the recipe! @ Laura: Glad you tried it out and it came out okay. I actually made this again on Monday night and I left it in 30 minutes too long and it still came out yummy, though dry especially by the next evening. This last time, I did soak the raisins in tea, but I think they could have gone for longer -- maybe even overnight. Chai could be super yummy, but I personally like the strong anise flavor so I wouldn't want anything that competed too much. Can't wait for dinner at your place! Your bread looks great, and I like the changes you made to the recipe. I wouldn't have originally used assam melody tea had it not been for the recipe challenge. I like the idea of chai that one of the commenters said. Might have to hunt down more figs and make this again. @ Jenny: Thanks so much for the recipe -- it was a brilliant inspiration to add tea :) I tried something last night with blackberry cornmeal muffins w/ earl grey. Yum. You've got me hooked. I made this a few days ago...it was delicious! I loved the black tea flavor. Thanks for sharing! This is one of a kind fig bread. I never had a fig bread before. 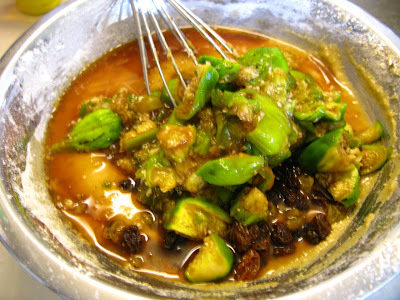 Figs don't grow in the Philippines but hopefully I could make this recipe one day.